The white snake goddess of Chinese myth is once again one of the chosen wicha for this year that many masters are deeming fit and necessary for the astrological outlook this year. The takrut is imbued with the invocation of the Nang Paya Ngu Khaw demoness enchantress prai deva. The white snake goddess has immense psychic and miracle powers because she practiced austerities for a 1000 year period, until she attained heavenly powers. She is able to blast away all obstacles, and to perform maha sanaeh enchantments that will ensure a love affair and seal its fate. She also likes to help humans with metta magic. Mostly this wicha has been applied in the form of a locket, but Luang Ta Chuan said that he had been mentally communicating and recieving the spiritual connection with the white snake goddess, and that he was able to invoke and imbue the albino snake skin takrut with the mind presence of the goddess, and that this has worked much more powerfully than the locket method. It seems that once again, Luang Ta makes his amulets different to anyone else as usual, which is part of his fame and popularity, that he has his own original style of sorcery, and copies no one. The takrut is made from a takrut tone leaden yantra foils with the Paya Ngu Khaw invocation spell and other metta and maha sanaeh yant and sacred na inscribed. 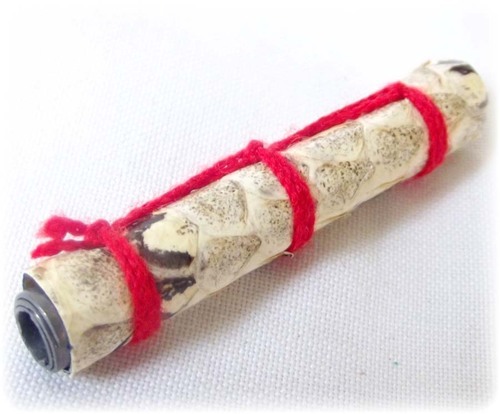 This is rolled up, and covered with a second takrut layer made this time from the albino snake skin of the Paya Ngu Khaw also with inscription of spells. 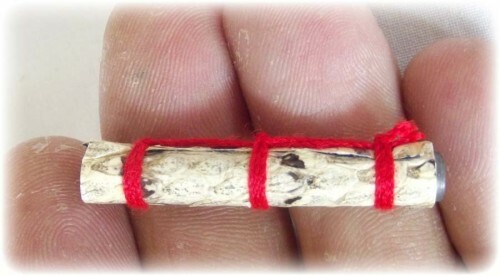 This is what makes this particular form of white godess amulet more powerful than many others, because it uses the authentic physical animal counterpart for the body of the goddess to inhabit. Then the spell was bound and sealed with Daay Daeng Akom (red magical cord binding), and given its final empowerment and sealing spell. Luang Ta Chuan is so famous for his Kumarn Tong and lottery coin amulets, that it sometimes goes unnoticed that actually, Luang Ta is not only a Kumarn Tong, lottery potion (metta oils) and lottery coin master, he is a master of many different wicha, but mostly they are all imbued with extreme maha pokasap and choke lap power, which is indeed a grand specialty of Luang Ta Chuan, whose magical inclinations and characteristics are more metta mahaniyom, choke lap and maha pokasap. The snake is known for its magical properties as a metta mahaniyom and maha sanaeh wicha, with an element of klaew klaad evasion magic too (slippery and hard to keep hold of in a fight – easy to slip through and escape).The python wicha is full of metta, and even has pheromonic aromas that instigate the endorphines and somatic glands to excite a person sexually. Snakes survive easily in their natural habitat, and the ease with which they catch their prey, and their survival powers are considered to be naturally magical powers present within python wicha amulets even without further incantations or psychic empowerment. Their musk has been used in perfumes and other potions to attract friendship and love for centuries in many cultures. It is also traditionally believed, that he or she who dreams of a snake, will find their true partner in life. When snake skin is rolled into a takrut spell, it adopts the additional magical property of assisting gambling, speculative risk, and business operations. Customers will increase on an ever rising rate, and regular customers who return to buy more are increased. Luang Ta Chuan is the nephew of the great Luang Por Mui of Wat Domn Rai, which explains where he got many of his so very powerful wicha from, but not only did he learn all that Luang Por Mui could teach him, he then went for tudong wandering with the great Luang Por Jong of Wat Na Tang Nork, for a period of many years. These are two of the greatest sorceror monks of Thai history, and this makes Luang Ta Chaun a holder of some of the most important master wicha, and the continuation of not one, but two great magical lineages of LP Mui and LP Jong. 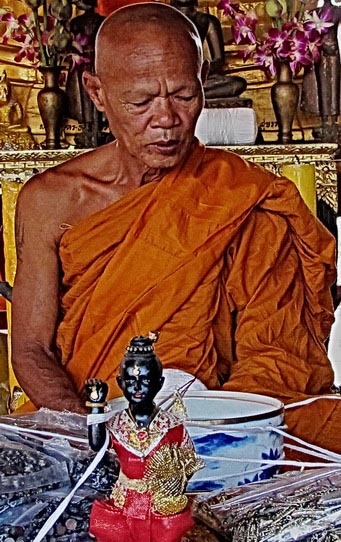 Luang Ta is a master sorceror monk, whose choke lap and maha lap amulets are of the most effective to be found, for example his Rian Laekhasart lottery coins, and Ngern Pling Laoatian monetary unit amulets which have brought so much success and prosperity to many a merchant and gambler. The takrut also containts the Yant Serm Rak, which increases love in the hearts of admirers and lovers. 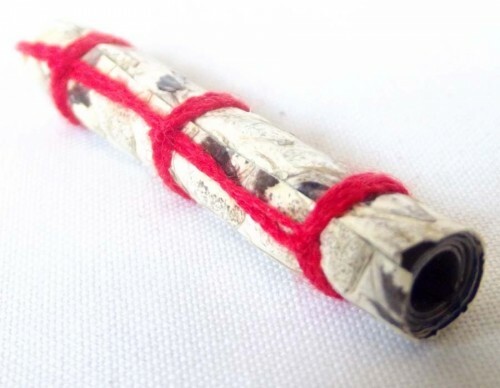 In the maha sanaeh aspect of the takrut, the charm works well as an aphrodisiac and enchantment spell for attracting and wooing the person you desire to love you. The metta maha sanaeh properties of the takrut also are useful in litigation and legal disputes (court cases). Luang Ta says that he had to master the Kammathana realizations of Asubha Kammathaan, and the Kumara Sadti meditative skill. He had to develop the consciousness of the death state to be able to bcontact and invite the dead spirits of prai devas to dwell within his amulets. It is necessary to attain Arupha Jhana and extinguish all sense of taste, smell sound and touch, in order to tune in to the devas of the realms of the dead. Luang Ta Chuan is very famous because of his amazing ability to give accurate lottery numbers. 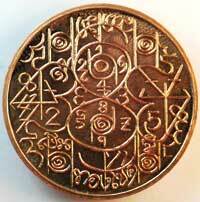 His famous ‘Rian Hai Huay‘ lottery wishing coin amulet has had success with several devotees winning lotteries. Many of his amulets have reached international fame including the Sivalingk See Nang Lorm ‘Palad Khik‘ type maha sanaeh amulet which features a metal Shiva lingam encircled by 4 naked maidens.